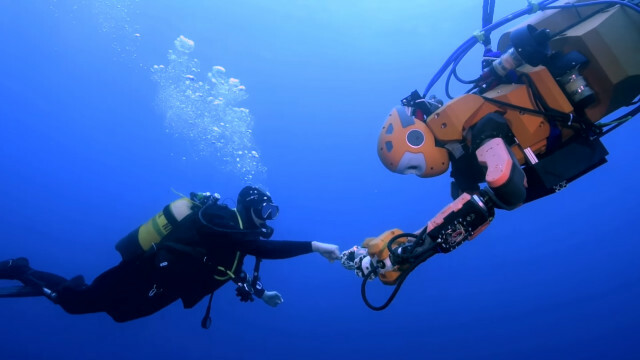 The maiden voyage of a humanoid robotic diver has gone swimmingly, concluding with the successful recovery of an antique vase from La Lune, King Louis XIV’s flagship, which sank in the Mediterranean in 1664. The mermaid-like robot, called OceanOne, consists of a five-foot torso, a head with stereoscopic vision and two fully articulated arms. The torso houses the robot’s batteries, computers and eight multi-directional thrusters. Each of OceanOne’s wrists is fitted with force sensors that relay haptic feedback to the pilot’s controls, enabling pilots to feel whether it is grasping something firm and heavy or light and delicate. In the future, the robot’s designers plan to add tactile sensors to its fingers as well. Although OceanOne can be piloted manually, the sensors in its body monitor current and turbulence, allowing the robot to activate its thrusters automatically to keep it in place. Small motors are also attached to the arms in order to keep the robot’s hands steady while it works. The arms themselves can be used to brace OceanOne for impact if its sensors detect that its thrusters are not sufficient to slow it down. Although the ultimate goal is to reduce the need for divers to be physically present, one cited advantage to OceanOne’s design is its ability to communicate with human divers through hand gestures. There’s a clear emphasis on biomimicry in the robot’s design, particularly the head which houses its stereoscopic cameras. That being said, one can’t help but wonder why the designers didn’t take it a step further and incorporate elements from fish locomotion or insect vision. The robot’s humanoid head might be a friendlier way to incorporate stereoscopic vision than using fiber optic cameras mounted on flexible stalks like the eyes of a sea slug, but if the goal is to submerge these robots in the ocean depths, practicality should take priority over aesthetics. 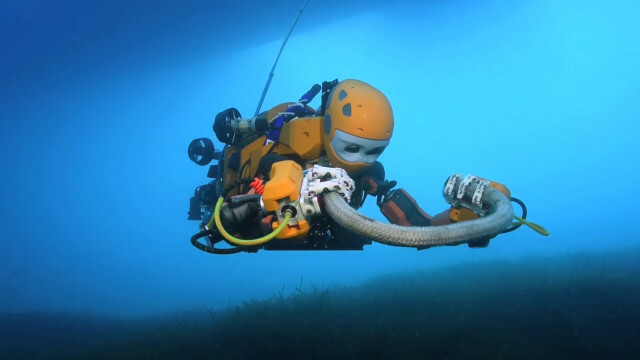 In any case, the robot is obviously well-suited to numerous tasks that are too dangerous or impractical for human divers, such as deep-water mining or oil-rig and undersea cable maintenance. While exploring the La Lune shipwreck, Khatib was forced to take control of OceanOne when it became wedged between two cannons. Reverse thrusters proved insufficient, so Khatib took control of the arms and had the robot perform a sort of pushup to free itself. 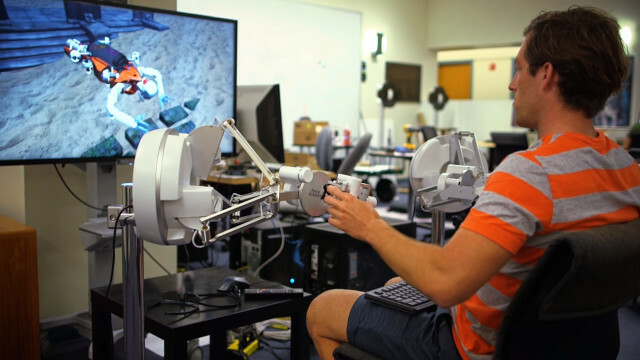 Khatib worked with a number of undergraduate and graduate students to build the OceanOne prototype and also drew on the expertise of mechanical engineering professor Mark Cutkosky to build the robotic arms. With the success of OceanOne’s maiden voyage, Khatib and his colleagues hope to build more units that can collaborate during a dive. Beyond the potential applications for research and industry, this could open up a whole new approach to underwater tourism. Why squeeze into a wetsuit when you can kick back with a pair of haptic joysticks and a HoloLens and play Jacques Cousteau from your living room?